even though spring is officially here, the weather is still gloomy and expected to get even worse over the course of the coming week. That's not a bad thing at all for me, since winter is my favourite season. And I am still praying for snow. So I decided to paint my nails with a bright colour that would match both a spring and a winter scenery. The colour I chose is Chanel Riva, which was kindly gifted to my by my good friend 'Chelle for my birthday. 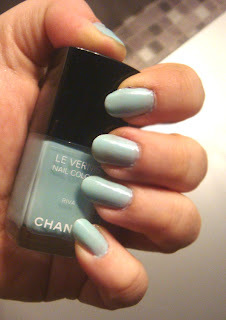 I am so excited as this is my first Chanel polish and the colour is fantastic!!! I applied two colours and had almost perfect coverage. I think a third one would be needed to make it fully opaque but I decided to stop at two. I was very pleased with the formula as it was easy to work with and the polish dried really fast too. When hit by the light, a blue shimmer appears in the polish, As we have no sunshine lately I tried my best to capture it using flash. It appears mostly in the bottle though. Maybe in the bright sunlight it shows on the nails too, I am not sure. 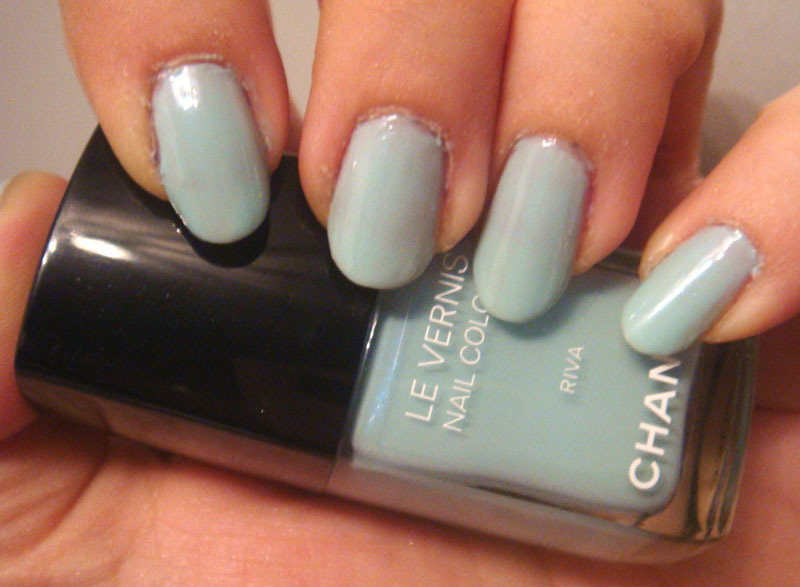 Do you own any Chanel colours? What is your favourite one? Riva looks absolutely beautiful on you my dear!! I am so glad to hear you like it and that had a better time with application than I did =) The shimmer is really subtle in the sun unfortunately - you need a magnifying glass to see it! Τα Chanel είναι πολύ καλά ποιοτικά και μου αρέσουν πάρα πολύ! Πολύ καλή επιλογή και το χρώμα ότι πρέπει για την εποχή! This is suuuch a pretty colour! I think Chanel nail polishes are better in darker colours (like Blue Satin, love that), the lighter/pastel ones can be a bit on the sheer side! 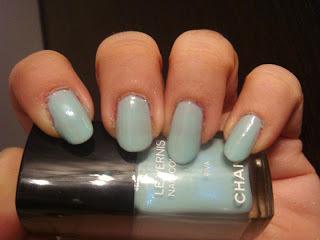 Btw, I think you 've inspired a light blue mani for tonight, hehe! I am drooling over this colour...!! !It's perfect for this time of year!I love all my Chanel polishes but I think my fav has to be "Noir Ceramic"